Mo-chica's Ricardo Zarate held his 17th tasting dinner last night, but he threw in a first--the premiere performance of the trio Cachaça Nova. The star, on saxophone, was Street Gourmet LA's Bill Esparza, known for his blogging about Mexican and Brazilian food. 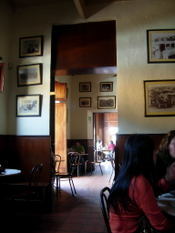 Their golden, mellow notes and Brazilian rhythms seasoned Zarate's inventive Peruvian food. The fourth member of the group was a pisco sour, stationed at Esparza's foot until he took a break. Everyone else got pisco sours too. They were the third of six courses, just as a sorbet shows up in the middle of a formal dinner. Zarate's papa rellena, a show stopper right at the start, blended mashed potatoes with tiger prawns. The black mint sauce, which was green, not black, contained no mint as we know it. Black mint is Zarate's name for Peru's huacatay. Slices of tuna tiradito were each topped with a crisp fried garlic slice, which pointed up the tenderness of the thinly sliced raw fish. To season this Peruvian style sashimi, Zarate used a spicy lemon soy dressing and a vinaigrette that included miso and aji amarillo (Peruvian yellow chile). 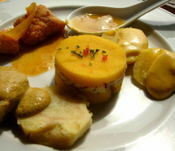 Next came the pisco sours, then servers brought lenguado, swordfish with a walnut cream sauce that also contained aji amarillo. Tender roasted tomatoes flanked the fish, which was supposed to have been halibut. When that wasn't available, Zarate switched to swordfish. The heartiest dish was arroz con pato, a saucy bowl of Peruvian style duck confit on a bed of cilantro rice. Dessert was the Peruvian classic suspiro a la limeña, a dulce de leche pudding topped with a swirl of meringue. Call the restaurant to learn about future tasting dinners. There's no guarantee that Esparza and Cachaça Nova will be there next time. Esparza is a pro musician, with plenty of gigs here and in Mexico. There wasn't an empty table in the Mercado La Paloma last week when Ricardo Zarate of Mo-Chica, the Peruvian restaurant that has been getting a lot of accolades, staged a tasting dinner. The six courses started with a purple potato soup (right) traced with a swirl of tangy feta cheese dressing. 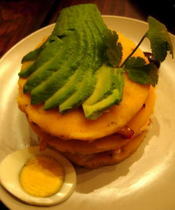 Zarate had fun with the layered potato dish causa (at top). He turned the potato mixture into a fried croquette. Instead of layering the chicken filling, he piled it on top. A deconstructed ceviche (right) combined Santa Barbara seabass and sea urchin with a couple of types of seaweed and Peruvian giant corn. Peru's aji amarillo (yellow chile) added a touch of spice. Santa Barbara seabass (right)came on a bed of quinoa risotto with English peas, followed by tender shortribs with pureed corn and fried yuca. Dinner ended with maracuya creme brulee, a cup of golden passion fruit custard with a crackly sugar crust. Mo-Chica holds six-course tasting dinners the last Thursday of each month with a different menu each time. The price is $35. Mo-Chica Peruvian restaurant, Mercado La Paloma, 3655 S. Grand Ave., Los Angeles, CA 90027. Tel: (213) 747-2141. "It can't be done," my chef friend insisted. 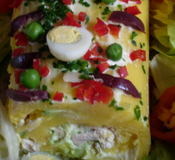 "You can't make causa with American potatoes. The moisture content isn't right." We were talking in Lima, Peru, where causa, a layered concoction of mashed potatoes, seafood or chicken and avocado, is commonplace. Despite what he said, this past weekend I had excellent causa in Los Angeles. And it was made with ordinary supermarket red potatoes. 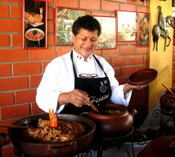 The chef responsible was Ricardo Zarate, who has just opened Mo-Chica, a Peruvian restaurant in downtown Los Angeles. 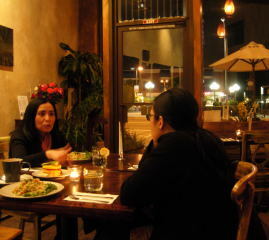 Mo-Chica is refreshingly different from the lackluster Peruvian places I've run into here. Zarate, from Lima, is an experienced chef and presents Peruvian food as it should taste rather than altering it for customers who wouldn't know the difference. The menu is short, a list of Peruvian top hits that are very well done--I've tasted almost all of them--amplified by specials of the day. Last weekend's causa contained a layer of the sort of spicy tuna you'd find at sushi bars. This is not surprising, considering that Zarate has cooked at Sai Sai at the Millenium Biltmore downtown and at Zu Robata in West Los Angeles. He is now executive chef of Wabi Sabi in Venice. Somehow, he finds time to handle both gigs. This Japanese-Peruvian connection isn't unusual. 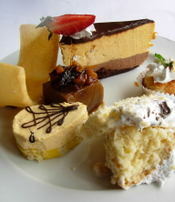 If you go to Lima, you will run into a lot of Chinese and Japanese food. And potatoes. 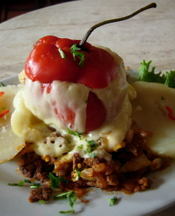 Spuds turn up as fat fries on top of lomo saltado, which is Chinese-style stir-fried beef. This is not a nod to American fast food. It's the way lomo saltado is served in Peru. The seasonings include soy sauce and ginger. For papa (potato) a la huancaina, Zarate makes a mellow, creamy cheese sauce that is light years away from what I encountered at another restaurant, where the gooey mixture could have come straight from a squeeze tube. 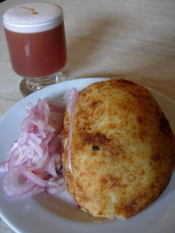 His sauce employs feta, which he finds similar to Peru's queso fresco (fresh cheese), and the Peruvian chile aji amarillo. Zarate's cooking is sophisticated. And affordable. Seco de cordero, a wonderful dish of lamb shank with canario beans in a beer and cilantro sauce, is just $13, and that includes taxes, as do all the food prices. The causa of the day is $5. Papa a la huancaina is only $3. And if you're eating on the run, there's a sanguche (sandwich) of the day for $5. 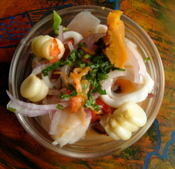 Of course there is ceviche--it's Peru's most famous seafood dish. 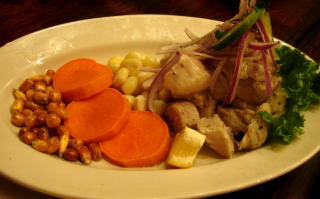 Zarate varies it according to what he finds at the market and presents it Peruvian style with sweet potato and giant corn kernels. Last weekend he picked out excellent salmon, which he served on a green mixture of English peas, barley and cilantro. Seafood and rice (arroz con mariscos) is a sort of Peruvian paella, but much spicier than anything you'd come across in Spain. Zarate does a fine version of aji de gallina, shredded chicken in a cream sauce that includes ground walnuts. That is a Peruvian classic. but he goes beyond the usual with quinotto, turning the Andean grain quinoa into a risotto with wild mushrooms and creme fraiche. 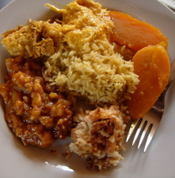 An interesting herbal flavor sets apart arroz con pollo (chicken and rice). To achieve this, Zarate cooks the rice with beer and cilantro, then adds pan-sauteed chicken and a dribble of huancaina sauce. Last weekend he tried out a dessert, algarrobina mousse, that was so well received it's going on the menu. The rich, molasseslike flavor and deep brown color come from Peruvian algarrobina syrup. That long word means carob. 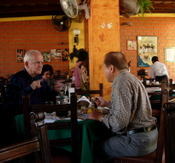 Mo-Chica isn't a stand-alone restaurant but a location inside the Mercado La Paloma. Large jars on the counter contain typical Peruvian drinks such as chicha morada, a dark, purple-red liquid made by boiling purple corn with pineapple rind and cinnamon. 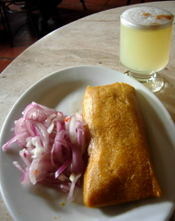 The drink on the left in the photo is maracuya, or passion fruit. Another is made with barley. But don't ask for Peru's national cocktail, the pisco sour. The Mercado La Paloma is a no-alcohol zone. No reason to complain though. 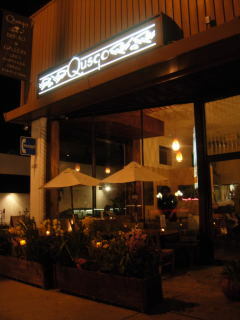 You can get pisco sours elsewhere, but not Peruvian beverages as well made as those at Mo-Chica. Mo-Chica Contemporary Peruvian Restaurant, 3655 S. Grand Ave., Los Angeles, CA 90007 (in the Mercado La Paloma). Tel: (213) 747-2141. Open 11 a.m. to 10 p.m. Monday through Saturday.